← Hello, world! I’m finally doing it…. 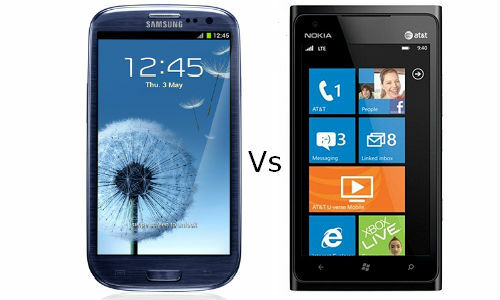 Battle of the Smartphones: iPhone 5, Samsung Galaxy S III or Nokia Lumia 900? The first thing you have to know about me and smartphones is that we go way back. I started programming cell phones back in 1999 and spent the next six years in the wireless industry. So when I make decisions about phones, it’s coming from years and years of being a “power-user” as we’re called. My device is an extension of who I am. Since I teach people how to use social media for their marketing efforts, I’m always online. It’s a pretty much 24/7 non-stop kinda game and mobile is a big part of my day. My phone sleeps next to my head, I haven’t used a watch or regular alarm clock since the 90s and I freak out when it falls to the bottom of my huge purse and I have to dig around for more than 10 seconds…hoping that I didn’t leave it somewhere behind and have to experience near panic attacks if I don’t touch it or it’s not within (or ON) my actual body at all times. Maybe I need a meeting, but hey, this is important. So I’ve been a hugely loyal Apple fan since my days of working at AT&T when I actually sold the very first generation iPhone back in 2007. It took me a bit to get off my Crackberry and switch over, but once I did, I was in love. Fast forward to present day and I’ve had several generations of the iPhone. Now I want something different. Their glitz and glam and multi-million dollar advertising budgets can only go so far on me now. I want something cooler, better. After playing with each phone, I’ve come to a conclusion. My final selection is on its way to my as we speak. I’ll be blogging about it then. Which phone would you choose? Posted on November 15, 2012, in Uncategorized. Bookmark the permalink. Leave a comment.